Yigit stood toe-to-toe with Baranchyk in a fan friendly contest at the Lakefront Arena in New Orleans, but severe swelling around the Swede’s left eye forced the ringside doctor to stop the fight at the end of the seventh-round. “The ring is where I feel at home, so I can’t wait to get back, especially in Germany as I’ve always had great support from the German fans,” says Yigit. “I’ve learned a lot since my fight with Baranchyk. We’ve studied what went wrong and looked at what could’ve gone better. We also saw a lot of good things that we have developed on and improved even further. “I got an amazing reception after the fight. Unfortunately, I didn’t bring home a win, but I did win many fans that night. They really like the way I fought. “The irony is that it was my swollen eye that got me famous worldwide, and now that it’s healed, I don’t think people will recognise me anymore so I’ve got to make sure I get famous for my boxing next time. “I haven’t lost any motivation. All I wanted since that fight was to get back into the ring and to keep walking the path to the top. I started training four weeks after my last fight, so I skipped Christmas and went straight into camp. “I’ve been preparing in Las Palmas, Spain. Sweden is very cold at the moment, and Las Palmas provides me with a good climate and all the facilities I need. 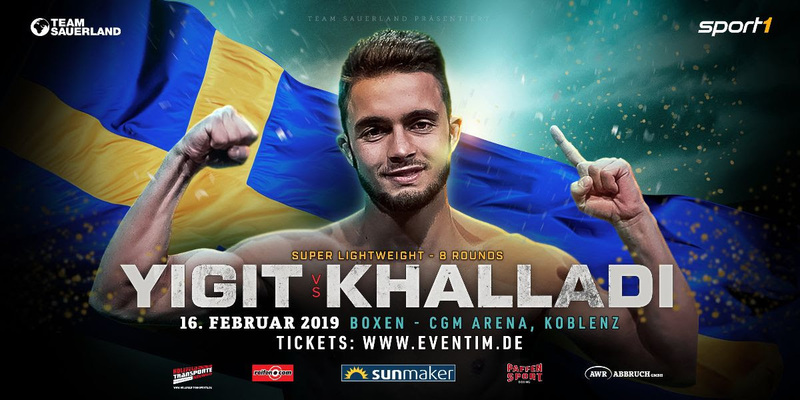 Yigit says he will not take Khalladi for granted, having been warned of his opponent’s toughness by one of the Tunisian-born Italian’s former foes. Abass Baraou tops the bill in Koblenz with a WBC International Super Welterweight title fight against former World Champion Carlos Molina, while Leon Bunn looks to continue his unbeaten run against Viktor Polyakov, and 17 year-old female amateur star Sophie Alisch makes her paid debut. Tickets for the CGM Arena on February 16 are available via www.eventim.de.